Intelligent Office Brickell is moving forward as Office Edge Miami and will begin the transition from the Intelligent Office Franchise System. Robert Ramsden, President of Office Edge Miami, says “we took advantage of an offer to buy out of the franchise and become an independent business”. 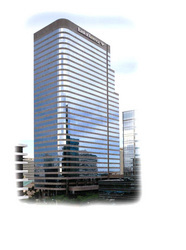 Office Edge Miami, located at 701 Brickell Avenue is in the heart of Miami’s Financial District, providing Executive Suites, Virtual Offices, Live Bi-Lingual Receptionist Services, Conference Room Rental and International Mail Forwarding. Office Edge Miami’s clients include: lawyers, accountants, real estate brokers, technology companies, financial services professionals, importers and exporters and manufactures. The business owners utilize their virtual assistant for secretarial support, appointment setting, client service, call center activities, bookkeeping and mail forwarding. Ramsden and his team believe “our world class client service approach is what differentiates us from the other Business Centers”. Office Edge Miami provides fully serviced virtual office, executive suite, conference room, live receptionist answering service and virtual assistant solutions through our network of Class A offices. With Four South Florida locations in Coral Gables, Boca Raton, Sunrise and Miami, Office Edge is your connection to the International Business community.